It is a universally agreed upon fact that story problems are just confusing, for kids and teachers alike. Each district-purchased text or program presents a variety of strategies, but those strategies are not always conclusive, meaning they don’t always work for all problems. To add to the confusion, as I work in different classrooms around the country, it seems that every teacher has a different way of teaching story problems which can be challenging for students as they advance from grade to grade. In the absence of consistency, or a common language around problem solving, students learn to do it the way their teacher does it so they can be successful in that particular class. But then, next year, they have to learn a whole new way to do things. This chameleon mentality might help students pass the class, but it does little to build a foundation of successful problem solving skills. In order to create systemic change, we need to create consistency. There are several key elements that we put into place when we work with our project schools. First, we want students to see the exact same Step-by-Step Model Drawing poster in every class they visit, Kindergarten through fifth grade. Second, we want the journal template for application problems to look the same when students go to solve problems in their journals. Finally, we want students to follow the same step-by-step model drawing process so we can equip students with strategies that are consistently effective in all kinds of situations. Reading the problem means putting lines in where there is new information. I know I’m going to put the question in sentence form and the reason I do that is so I know what the question is actually asking me. I put in the who or the what next so I know what the story problem is about, and I put in that unit bar, not knowing the total value, but it can hold the place of what the quantity is until I know what the problem is asking. Then I decide how to chunk and label that bar based on the information I read in the problem. After that, I can figure out where that question mark goes. And then, as they go through and solve, kids can more accurately make a decision about what kind of math they need to do to find the answer. After working through a step-by-step process like that, students can usually look at their unit bar and quickly figure out which operation is required. They have a different lens, and that’s what is consistent. 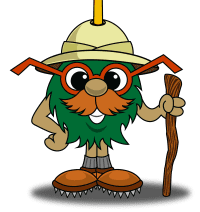 After 40 days of modeling, students are able to use these strategies independently, internalize the steps and picture their friend Professor Barble as he slows down to think about what the problem is actually asking, using reading comprehension cues instead of impulsively deciding what operation to perform in order to solve the problem. This consistency leads to a common language, which is what we are really striving to create in our schools. In a district that has seven elementary schools, when I’m coaching with principals and teachers, it is reassuring to have a consistent method/strategy that kids and administrators can depend on. It also helps as we holistically look at data and work towards goals. For the first time this year, after working to implement these consistent elements throughout our project schools, I’ve started to hear students in other classrooms saying things like, “Hey! I have that Math Mights poster in my fifth grade classroom,” while they are in a second grade classroom. Or a fourth grader might say, “We use those same problem solving steps!” when they’re in a second or third grade classroom. That’s the consistency that we’re trying to provide. Consistency builds confidence, and a child with confidence will feel capable of tackling a problem that might be worded in a really difficult way. 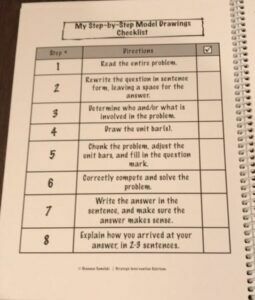 Our math journals, along with the coding process that we’ve been exploring in the past few blogs, have been an important way that we’ve been intentional in how we approach word problems with our project schools this year. When creating consistency, even the format of the problems can support or detract from a child’s success in model drawings. Think about a typical page from a math series that contains model drawings. There are probably five or six story problems squished onto one page, with maybe an inch of room around the edge. Certainly not enough room for a child do to a model drawing. As a result, most kids resort to the “guess and check” method so they can simply be done with that page. Our idea is that less is more. If we can take just one of those problems from that crowded page, and provide room for the child to solve it correctly using the model drawing process to show they’re actually comprehending what the words say, we believe this is the key to unlocking and increasing student achievement. Our journal is a spiral bound consumable that goes right along with the Eureka Math program. 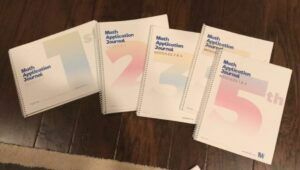 We had a group of math leaders that have gone through and taken the application problems from the books, coded them, and put them onto our journal template. We’ve also worked in Math Expressions and My Math K-5 to pick a story problem from each of the different lessons, code them, and make them into a journal as well. How do you get started with this movement in your school? “Go slow to go fast” has always been my motto. This means that you must first understand yourself and mold your own math mindset, and there are several ways you can do that. If you’re in the Michigan area, we’d love to help you during our Model Drawing Workshop on March 7th! We’re also taking on new project schools! When we work with schools we try to work on one objective so that it’s something that’s digestible for teachers. Today, it seems like teachers are given 18 new things to implement yesterday, but nothing ever goes away. This creates so many inconsistencies as these ideas never get developed to fidelity. Our strategy is not to overwhelm or add another thing to a teacher’s already full plate. The story problems we use come from whatever math series your district uses. You don’t have to do an entire program and then do a bunch of extra story problems! Be sure to contact us today if you are interested in working with us to implement consistency and a common language in your district! Space is limited! 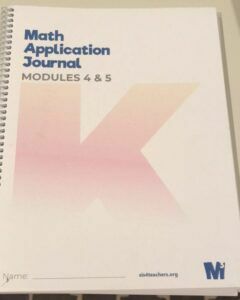 Currently, the math journals are being piloted in our project schools. We’re still finding things to tweak, but in the near future, we hope to be able to provide these journals as a service for schools so can really implement consistency around what we’re doing with model drawing on a broader level. Developing consistency takes time, whether it’s number talks or using the Math Mights or having a common language in an elementary building. In something like model drawings, we must remember that we are equipping students with strategies not for today, but that they’ll be able to use in middle school and high school. We also want to encourage our middle schools to begin adopting the same philosophies to help them with ratios and understanding proportions. We want middle schools to understand why model drawings are such a pivotal step in algebraic thinking. We all want our problem solving scores to go up, but we have to really look at what we are doing that is really consistent, not just for second graders, but for all students. It doesn’t matter what book you have, model drawings simply provide the scaffold and the coding helps teachers be able to digest and embrace the strategies so they can feel comfortable helping students succeed.